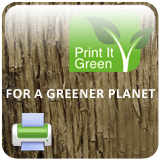 Print-it-Green™ - You Print, They Plant Trees | TonerGreen - Eco-Friendly Toners from the U.S. When printing, have it ever crossed your mind the numbers of trees being cut down every year to produce those papers coming out of your printer. Well, a group of environment-conscious software developers did, giving way to the creation of Print-it-Green™, "the world’s first green advertising platform to offset environmental damage of printing online - by planting trees." Introducing "the world's first online paper waste carbon-offsetting service", Print-it-Green™ is designed as an innovative approach that "opens a new way to communicate green and social-responsibility messages to the public, coupled with advertising, which sponsors our eco-friendly activities." It features toolbars and an innovative monetised application known as the monetisationoption specifically developed for widget creators to get an additional revenue source, brand enhancement and the opportunity to contribute to the environment. The Print-it-Green™ service is prompted when you print content of a website (by pressing the "print" button; CTRL+P, or any other way). A Print-it-Green™ eco-friendly message appears alongside the standard "print wizard", containing an advertising informing the user that the Publisher will be offsetting the print event by planting trees. Print-it-Green™ plants trees funded by the advertising fees. Want to know more about the Print-it-Green™, visit its official page at http://www.printitgreen.com. And while using Print-it-Green™, make sure to use eco-friendly toner cartridges and ink cartridges as well so you help contribute to energy conservation, sustainability, and environmental responsibility. This blog is providing good and informative information. Thanks for sharing post.